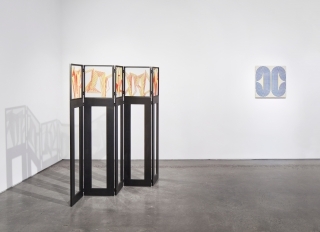 Cristin Tierney Gallery is pleased to present Hard Edges, a group exhibition featuring Lorser Feitelson, Elise Ferguson, and Alois Kronschlaeger. 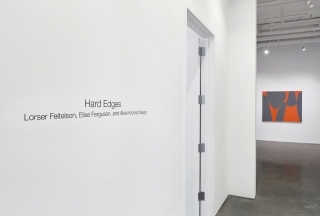 Hard Edges will be on view from March 1st through April 7th, and the opening reception will take place during Armory Week on Thursday, March 8th from 6 to 8 pm. 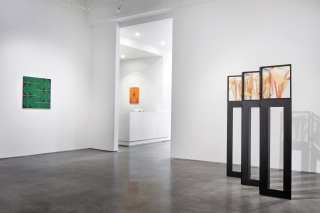 Ferguson and Kronschlaeger will be present at the reception. 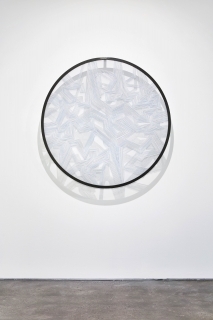 One of the more salient congruities in the exhibition is the artists’ formalist approaches. 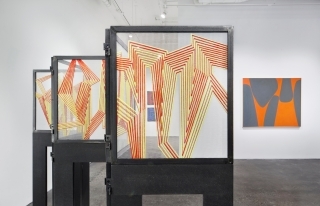 Magical Space Forms by Feitelson, for example, features the geometric planes of uniform color that defined the artist’s signature hard-edge style. 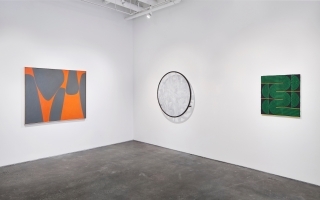 As a rebuttal to abstract expressionism’s gestural brushwork, Feitelson’s paintings from this period balance simplified forms with flattened space and smooth paint application. 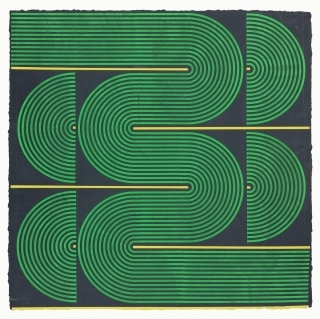 Although completely non-representational, Magical Space Forms creates a sensation of movement through undulating lines, use of scale, and contrasting colors. 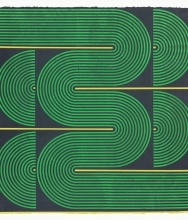 Using similar clean lines and bright colors, Ferguson and Kronschlaeger additionally experiment with optical illusions and interdisciplinary media. 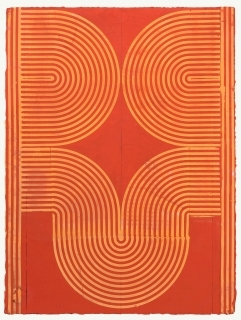 Ferguson’s paintings are comprised of built-up troweled layers of plaster, using techniques gleaned from painting, sculpture, and printmaking. 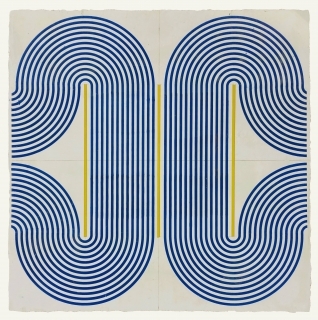 Their uneven surfaces and repeated patterns hint at illusionistic depth and suggest something representational, but in fact their forms are based on geometric variations the artist creates on her computer. 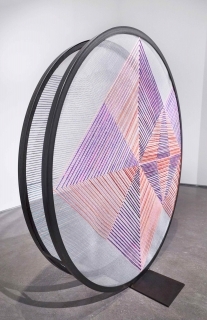 Perception is likewise revealed to be flexible by Kronschlaeger’s fiber works, which are created by threading Merino wool through aluminum mesh screens, combining weaving, sculpture, and painting. 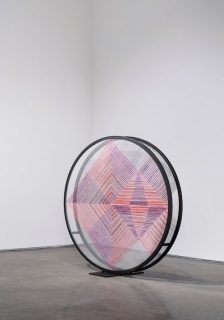 Some screens are designed to be viewed in the round, while others hang several inches off the wall to allow light to shine through and cast dramatic shadows. 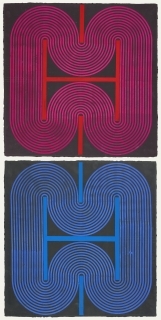 In both, the works’ structured compositions produce tension between figure and ground, as tightly concentric forms alternately advance and recede. 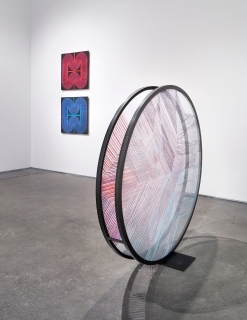 The result in the two artists’ cases is a body of work always in flux, resisting strict categorization. 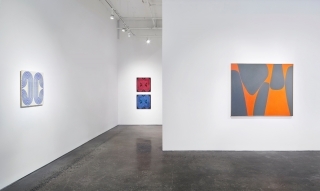 Lorser Feitelson (1898-1978) was a Los Angeles-based artist whose career reads as a mini-art historical survey, moving from Cubism and Post-Surrealism to biomorphic abstraction, hard-edged abstraction, and beyond. 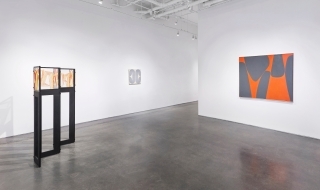 He was a leading figure in Los-Angeles abstraction, and his work has been included in many institutional exhibitions on California art. 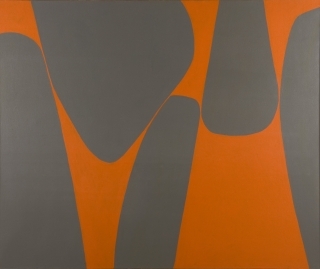 In 1959, his work was featured in the landmark exhibition Four Abstract Classicists at the San Francisco Museum of Art alongside John McLaughlin, Frederick Hammersley, and Karl Benjamin. 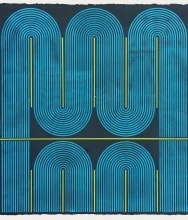 More recently, Feitelson and the abstract classicists were included in the Orange County Museum of Art’s 2007 touring exhibition Birth of the Cool: California Art, Design and Culture at Midcentury. 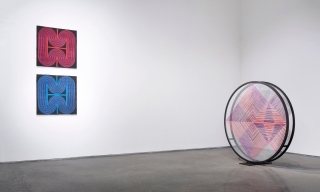 In September 2011, Feitelson’s work was featured in the Getty Museum’s Pacific Standard Time, and was also included in the exhibition’s transfer to the Martin Gropius in Berlin in March of 2012. 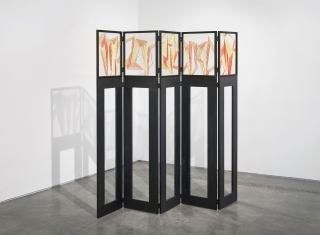 His works are included in the permanent collections of the Los Angeles County Museum of Art, the Smithsonian American Art Museum, the San Francisco Museum of Modern Art, the Whitney Museum of American Art, and numerous other public and private collections. Elise Ferguson (b. 1964) creates work that is both cerebral and physical, and reflects a fascination with her materials’ limits and capabilities. 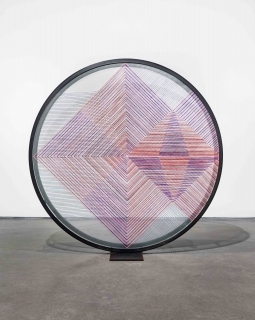 Her work has appeared in exhibitions at the Cincinnati Contemporary Arts Center (OH), SculptureCenter (NY), Socrates Sculpture Park (NY), Barton Art Galleries (NC), and University Galleries – Illinois State (IL), among others. 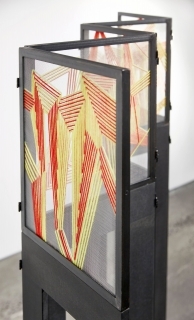 She has been recognized with several awards, including an EAST International exhibition grant, and residencies at Barton College, University of Nevada – Las Vegas, MacDowell Colony, Illinois State University, Socrates Sculpture Park, and Dieu Donne Papermill. Ferguson lives and works in Brooklyn, New York. Alois Kronschlaeger (b. 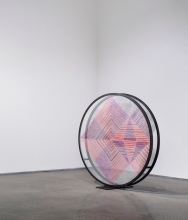 1966) is best known for his site-specific installations and sculptures, which demonstrate a preoccupation with environment and light, as well as an interest in exploring time and space via geometry. 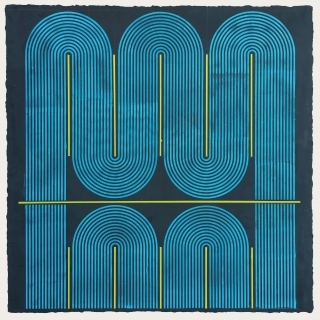 His work has been exhibited at such international institutions and festivals as The Bruce Museum of Arts and Sciences (CT), Yuan Art Museum (Beijing), MOCA Tucson (AZ), MAC Lima (Peru), and Islamic Arts Festival (Sharjah), among others. 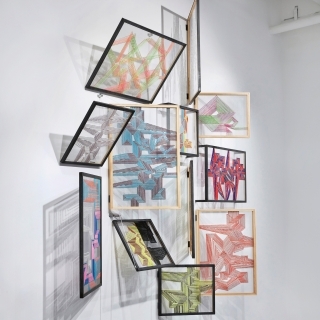 Since 2011, the artist has produced five site-specific public installations with SiTE:LAB, including Hybrid Structures, which consisted of a series of interconnected ramps and platforms that traversed a deconsecrated church campus. Upcoming projects include a solo show at The Figge Art Museum in spring 2018. Kronschlaeger lives and works in Brooklyn, New York.